MATAMORAS — Matamoras United Methodist Church, Matamoras and Mountain Road, off of 75, south of Port Royal, will offer music through August beginning at 9:30 a.m.
LEWISTOWN — First Baptist Church, Lewistown, 111 E. Third St, will continue its Wednesday summer program at 6:30 p.m., Aug. 15 with speaker Pastor Charlie Stump. A program runs simultaneous with the adult program. August leaders are Barbara and Phoebe Jones for ages 6 to 11. The program concludes at 8 p.m.
First Baptist Church is located across from The Bon Ton parking lot. The program concludes at 8 p.m.. For information, call Pastor Charlie Stump at (814) 380-1489. REEDSVILLE — Reedsville United Methodist Church, 60 E. Logan St., will host a free movie night at 6:30 p.m. Aug. 12. The movie will be “I can only Imagine.” Refreshments will be served. LEWISTOWN — Aug. 12 will be “Backpack Sunday” at Grace United Methodist Church, 101 Logan St., Lewistown. Every school-age child who attends worship that day will receive a free, fully stocked backpack. The service begins at 9:15 a.m. Everyone is welcome. REEDSVILLE — Church Hill United Methodist Church, 199 Woodland Circle, will host a free outside movie night at 8 p.m. Aug. 18. The movie “Coco” will be shown. Games with a Mexican theme will be available from 6:30 to 8 p.m., prior to the movie. refreshments will be served. Bring a lawn chair or blanket. BELLEVILLE — Maple Grove Mennonite Church, Belleville will hold a celebration at noon, Aug 10-12. There will be a bean soup and moon pie luncheon. Donations accepted. Weekend events will include, hymn sing on Friday and guest speakers John Sharp, Julia Spicher Kasdorf and Duane Kauffman. An Amish wedding feast will be held Saturday evening. Tickets are $15. Cookbooks and history booklets will be for sale and a quilt will be auctioned off. Visit maplegrovemc.org or call (717) 935-2513 for more information. 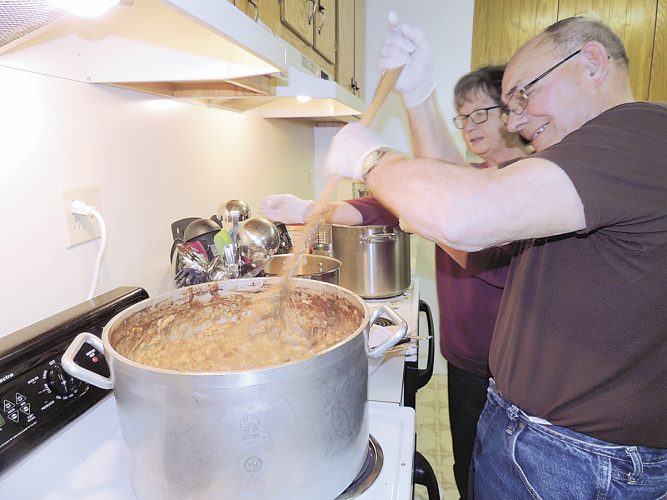 McVEYTOWN — Centre Union Church will host a spaghetti dinner at 4 p.m., Aug. 18 at the McVeytown Firehouse. The dinner will be donation only and benefit a mission trip to Mexico in November. Attendees can enjoy music, food, vendors and more. Musical entertainment includes: John Gibson, Trena Figard, Tonya Stoner, hymn sing-along and more. Local area vendors will have products for sale. Kids activities such as Bible stories, crafts and face painting will be available. There will also be food and baked goods available. The day ends with local youth competing in a lip sync competition. MOUNT UNION — The Assembly of God Church, 609 N. Jefferson St., Mount Union, will host a church picnic 10 a.m. to 4 p.m. Aug. 18. There will be music, food, vendors and more. Music entertainment includes Bob and Donna Piper, Paul Zook, Eric Armstrong, Trena Figard, Erica Wilson, John Gibson, Tonya Stoner, Linda Shope, a sing-a-long and more. Local vendors will have products for sale. Kids activities include Bible stories, a youth lip sync competition and crafts. Food and baked goods will be available. The kitchen will be open. EAST WATERFORD — Faith United Methodist Church, Main Street, East Waterford, is continuing its twice monthly community outreach, The Senior Gathering. August’s meetings will be 9:30 a.m. to noon, Aug. 23. The Gathering will be filled with fun, activities, guest speakers and snacks. BELLEVILLE — Locust Grove Mennonite Church will hold Trauma-Drama, a workshop to help educators, social workers, children’s ministry leader and parents understand the role of trauma that contributes to actions/reactions in the daily lives of children in the classroom, community and home. The program will be held from 9 a.m. to 3 p.m., Aug. 25 in the New Life Church Cafe, 101 N. Beech St., Burnham and includes a multi-session DVD and discussion series using Author Heather Forbes’ “Help for Billy: A Beyond Consequences Approach to helping Challenging Children in the Classroom. Fees are payable at the workshop. Lunch and snacks will be provided. For more information or to reserve a space, call or text (717) 437-4946 or (717) 242- 1481. LEWISTOWN — Adult Bible Study will begin at 7 p.m. Sept. 4 in the Parish office at Sacred Heart of Jesus Church, 9 N. Brown St. The class will study the book of Job. Participants may pick up books at the Parish office or get them the first night of Bible study. A $20 donation for the cost of materials is appreciated. For more information, call (717) 242-2781. McALISTERVILLE — Faith preschool at Bunkertown Church of the Brethren is still accepting registration for the 2018-19 year. The preschool is open to any child 4 years of age or younger as of Sept. 1. Cost is $25. For more information, call (717) 463-3572.